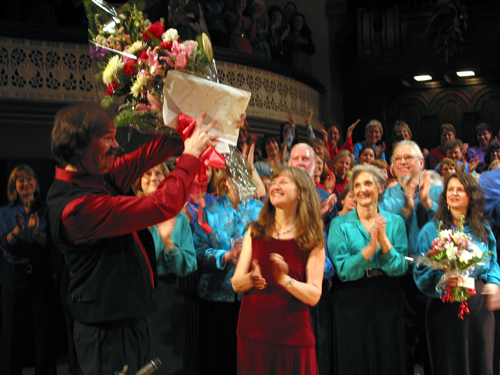 Traditionally at the end of many dance, theatre, orchestral and choral performances the various principals, soloists and guest performers are presented with bouquets by the company members in honor of their contribution to the event. These bouquets are often paid for by a collection taken up among the company's members in the weeks prior to the performance. Up until our Kapasseni concert in June of 2003 the members of the Getting' Higher Choir followed that tradition. Since that concert our choir has been creating a new tradition. The money we used to spend on perishable flowers now goes to long term practical purposes that provide lasting legacies. At each concert we donate what we have collected among ourselves to a Scholarship Fund in the names of those we wish to honour for sharing the stage with us in our end of session concerts. That fund is then used as follows. At the first Kapasseni concert after we stopped buying bouquets our Honouring Fund was used to start an orchard in Kapasseni. For all subsequent Kapasseni concerts, and currently when our June benefit concerts include other projects in Mozambique, our Honouring Fund has been used to provide scholarships for Kapasseni school children who have to live away from home to continue their education.